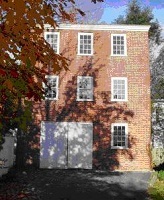 Behind number 16 Fruit Street is the three story brick workshop of Jacob Perkins, early America's great inventor. Here was printed most of New England's currency. Perkins also had inventions specially made for "Old Ironsides". Proceed down Fruit Street with stop 8.